Author: Annemarie Töpperwien. Series edited by: Archiv und Museumsstiftung der VEM, Wuppertal. The life and work of missionary wives on the island of Nias in Indonesia provides the focus of this study. Though scarcely mentioned in the relevant literature, the lives and misery, thoughts and achievements of these women was always closely entwined with the difficulties and hopes of the Nias mission. The “Gehülfinnen” (helpers) were crucial for the success of the missionary activities, yet their importance was only acknowledged if they failed due to illness or death. The contributions of the “einfältigen Seelen” (simple souls) were hardly noticed by the mission leadership and deemed unimportant, the women just were around and doing their job for the love of god. The author, who lived herself on Nias between 1958 and 1969 married to a missionary, sets out to honour the achievements of these missionary wives. Attention is given to those women that died early or became isolated, the weary, the mediating and the courageous. The book follows the stations of a missionary woman’s life, starting with the consent of the bride to the “Herr Missionar” and continuing on the difficult road at the side of their husband up to their mostly inconspicuous end on Nias or in Germany. Scope is given for their part in founding the missionary station, in developing the congregation and the education of their children, as well as their rather ambivalent position on Nias, being on the one hand a privileged white foreigner, on the other hand a subservient employee in the eyes of the missionary leadership. The book closes with short biographical entries of the individual missionary families. 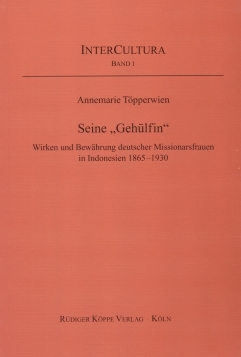 For her book the author used the monthly journals of the Rheinische Mission, station and personnel documents of the Nias missionaries in the archives of the United Evangelical Mission (UEM) as well as a diary and numerous private letters, ranging from the toilsome beginnings of missionary work on Nias in 1865, to about 1930 and the ordination of the first indigenous pastors. The present book is intriguing because of its lively language and closeness to its sources. It offers a dramatic insight into the everyday life of the missionary women and is a valuable source for historians and interested readers of Indonesian missionary history. Damit ist eine Problematik von A. Töpperwien aufgegriffen worden, die in der deutschsprachigen Missionsgeschichtsschreibung noch ganz jung ist: Die Rolle von Missionarsfrauen auf den überseeischen Arbeitsfeldern. Nur selten waren die den Missionar begleitenden Ehefrauen oder auch in späteren Zeiten allein nach Übersee entsandten weiblichen Mitarbeiter, wie Krankenschwestern, Lehrerinnen, Haushaltshilfen etc., Gegenstand der Berichterstattung in den streng patriarchalisch geprägten Missionsgesellschaften. Es ist ein großer Verdienst der Autorin, die relevanten Quellen im Archiv der ehemaligen Rheinischen Missionsgesellschaft gefunden und ausgewertet zu haben. [...] Es handelt sich bei dem Buch nicht nur um ein spannendes, die Wissenschaft befruchtendes, sondern auch notwendiges Buch.